Some people come to Blue Ridge for the finer things in life seeking out top end luxurious cabins while others are looking to submerge themselves deep in the mountains to reconnect with nature and to let the soul recharge. At JME Retreat, smores with friends and family by the campfire are calling your name! While this rustic gem tucked back in the Cohutta reserve is not fancy, it is a very quaint and cozy newly updated cabin that will provide you with an authentic mountain cabin experience you won't want to leave. Sitting on over 45+ acres, the outdoors are truly yours to explore! Sit by the pond and catch some fish or spend some time exploring the creek that runs through the property but, either way, it will be peaceful and private! Paved roads will lead you to JME Retreat, followed by a quarter mile gravel driveway leading to the nostalgic cabin sitting back off the road and out of sight. Once inside the cabin, you'll feel a unique blend of rustic elegance and traditional mountain living. It is the perfect retreat to hang your hat in at the end of the day after a long day of adventure to get a restful nights sleep. With one queen on the main level and the other in the open loft (stairs leading to the loft are steep), this cabin is perfect for a small family or a couple looking for a quiet evening by the fire pit or the wood burning fireplace soaking up the sounds of nature in the country! Located off of Old Highway 2 - 25 minutes from downtown Blue Ridge on 45 acres of secluded land. 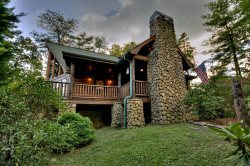 Certain conditions exist that are unique to the North Georgia mountain environment and are beyond the control of Southern Comfort Cabin Rentals. These may include, but are not limited to, indoor and outdoor pests such as mosquitos, stinging insects, snakes, spiders, ants, mice/rodents, and ladybugs.